It is good to be back after 9 years, if I use a slightly amended phrase borrowed from Madonna, the pop singer. When she visited Argentina, 13 years after she had played the main role ‘Eva’ in Evita, to sing to an ecstatic live audience ‘Don’t cry for me Argentina; the truth is I never left you,’ it was an overwhelming reception she received from Argentineans. In my case too, I never left the Central Bank. For that matter, no Central Banker could leave it behind to live a new life that has no part with the Bank. Though they are physically away from the grandiose atmosphere here, they live day and night in the Central Bank. They cannot forget that institution which had bred them, which had nurtured them, which had educated them, which had raised them to who and what they are today. As Madonna has sung in her song, they continue to live in the Central Bank ‘all through their wild days and all through their mad existence’ even after they leave it. To an ex-Central Banker, the Bank is inseparable from his life. Thus, once a Central Banker is always a Central Banker. This is true for me too. Hence, it is good to be back and it is good to return home. The Bank is viewed in high esteem in Sri Lanka’s contemporary society. When I ask my students at the university what they want to do in the future, the answer is always a single chorus. Without exception, all of them want to join the Central Bank. The reason? In their view, the Bank is the leader of the financial system, the leader of the economy, the leader of economic thought and the leader of many more. They want to jump on the bandwagon of that exclusive leadership and be the ‘master of Sri Lanka’s economy’ in the future. This ambition of the young generation today is not unusual. Even in my generation which lived some half a century ago, joining the Central Bank was one of the two career ambitions which a passing out graduate could afford to have. One was joining academia. The other was joining the Central Bank. All other career ambitions were looked at if you could not make it to either one of them. I joined the Central Bank, leaving a high paying career at the university as a lecturer, for a lower salary in the Bank. In hindsight, I may say that it was a prudent decision. I got the opportunity of working under seven Governors, and many more worthy intellectuals of the days gone by. When I mentioned it to the late Governor A S Jayawardena, he immediately corrected me. ‘Don’t say that you have worked under them,’ he said. ‘Say that you have worked with them.’ His point was that the Governor and other senior officers are not kings, but co-workers, enjoying equal status in the exclusive intellectual society which the Central Bank has created. In that world of intellectuals, there are no hierarchies. There, a person is rated only by his wisdom and nothing else. Thus, Central Bankers should demonstrate this wisdom in all their dealings, both within and outside the Bank. The wisdom to be demonstrated should be unbiased, impartial and objective without being coloured by different political hues, as advised by one-time Minister of Finance, Dr N M Perera to senior Central Bankers when he met them in 1971. 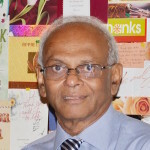 It is reported that Dr N.M Perera had said that the Bank ‘should make independent reports on economic subjects to the Government and not report merely to suit the political complexion of the Government in power’ and that ‘he would value reports (of the Bank) made dispassionately and objectively’ (See: Reproduced from Ceylon Daily News in the Central Bank of Sri Lanka 60th Anniversary Publication). Such dispassionateness and objectivity come only from independent minds. Independent minds are created by an independent culture and environment. Independent culture and environment are nurtured by recognition and appreciation of independence by all. Hence, the Central Bank’s independence is a product of both external recognition and internal cultivation. The former is an attribute which a Central Bank has to earn by being an exemplary institution. The latter is a quality which a Central Bank has to grow within itself through careful planning. Ever since Central Banks have been created to produce money through a centralised mechanism, their independence had been a subject of issue coming up again and again. This is because a Central Bank today produces money out of nothing, as if a magician produces a rabbit by waving a magic wand. This money has no intrinsic value of its own. The value comes from its ability to facilitate the owner to acquire a real basket of goods and services. They are called real, because they enable the owner to consume them directly, or use as an input for producing a further output. Because of this promise, people agree to exchange the real assets they own for the paper money which a central Bank produces on behalf of a Government. Though the Government is the institution behind the creation of a Central Bank, it is supposed to allow a Central Bank to produce money in accordance with the mandate which Parliament has given it. That mandate requires a Central Bank to supply money in sufficient quantities at the correct time, to facilitate the exchange of the output produced by the economy without disruption. Hence, money printing by a Central Bank is not evil at all times, as popularly believed by many. The problem arises if a Central Bank produces more money than necessary. In that case, the excess money will lead to creating an excess demand for goods and services, with two interrelated outcomes. One is the tendency for prices to go up, causing a decline in the value of the real basket of goods and services, which people can command by using money. The other is the leakage of that excess money out of the country through increases in the demand for imported goods and services. If the country does not earn enough foreign exchange to meet that demand, it leads to creating balance of payments difficulties, exerting pressure for the exchange rate to depreciate. Hence, both inflation and exchange rate depreciation are the result of a Central Bank producing more money than necessary. Accordingly, a Central Bank is required to play the game of money printing according to a set of prudent rules. If it does so, it can earn the trust of the people. If it does not, it loses their trust as well as its ability to get people to accept the money it produces. As such, a Central Bank should have freedom to decide how much money it should produce without the interference of outside parties. This freedom, in laymen’s language, is paraphrased as the right of a Central Bank to say no, when there is pressure from the Government or any other party to produce money in excessive amounts. As documented in the 2018 book edited by R Edvinsson and others on Sveriges Riksbank and the History of Central Banking, Riksbank, the world’s oldest existing Central Bank, established in 1668, ran into problems when it refused to finance King Gustav III’s military expeditions against Russia in 1788. The King reacted to the independence demonstrated by the Riksbank by issuing his own currency through The Swedish National Debt Office. It pushed the Riksbank to the backwater till 1802. That was surely a too high a price which a Central Bank had to pay for refusing to accede to the demands of a recalcitrant political leader. Since then, the independence of Central Banks was valued by academia who wrote on central banking. For instance, as reported by the Reserve Bank of India in its publication titled ‘The Genesis of Central Banking in India’, John Maynard Keynes, who was a part of the Chamberlain Commission of 1913 on India’s financial system, had submitted a memorandum, on the invitation of other commission members, on the establishment of a shareholder-owned Central Bank. This new bank, proposed to be called the Imperial Bank of India, was to be established by amalgamating the three Presidency Banks that had existed in Calcutta, Bombay and Madras. Keynes advised that the Secretary of the State, though he was the official behind it, has only the final word about the work of the Bank. Thus, he was the adjudicator of last resort. Its day-to-day operations, as recommended by Keynes, should be free from the interference of both the Government and the shareholders, since it might run counter to the general interest. In today’s context where Central Banks are owned by governments, what this means is that they should be free from the interference of political authorities. However, with the onset of World War I, Keynes’ wisdom could not be carried forward. It was in 1935 that the Reserve Bank of India was set up as a shareholder-owning bank with independence, and once it was nationalised in 1949, it got relegated to an institution that “traditionally functioned as an arm of the Government” prompting Governor C Rangarajan to call for greater autonomy for the Bank in a public lecture in 1993. Central Banks today enjoy a degree of independence ranging from full autonomy to partial autonomy. The global trend has been to go for greater independence in Central Banks within the last two to three decades. This trend has been supported by the realisation that greater autonomy in Central Banks helps countries to fight inflation more successfully. But this has not been the consensus among mainstream economists. In this connection, Daron Acemoglu, in a NBER Working Paper published in 2018, has given pre-qualifications, such as the presence of strong institutions, for an independent Central Bank to operate successfully. In the opposite, Nobel Laureate Joseph E Stiglitz delivering the C D Deshmukh, the first Governor of RBI, in Mumbai in 2013 had raised the issue of independent Central Banks failing to avert the financial crisis of 2007-8. Thus, according to these groups, independence is irrelevant and unnecessary to tackle today’s problems. However, a study conducted in 2007 by a team of economists attached to IMF and led by Marco Arnone has revealed that, while all Central Banks have improved their political and economic autonomy over the years, some Central Banks in the developed world, namely, Australia, Denmark, Iceland, Sweden, Norway, Switzerland and UK, enjoy full autonomy. According to this study, Sri Lanka’s Central Bank which has scored 0.5 out of 1.0 is categorised as a bank enjoying partial autonomy. The issues relating to the independence of the Central Bank have been discussed by me elsewhere. The main contention has been the placement of the Secretary to the Ministry of Finance as a vote-carrying member on the Monetary Board in terms of the Monetary Law Act as proposed by John Exter, the architect of the Bank. The criticism has been that the Finance Secretary, acting in self-interest, would get the Bank to fund the budget through accommodative monetary policy, thereby causing fiscal policy to override monetary policy. The past experience of the Central Bank shows that this criticism has some validity. But Exter’s wisdom was to create an environment for both the Government and the Central Bank to have a peaceful and amicable cohabitation. Exter argued in his report that “….there are, however, many important problems of monetary policy, especially those relating to fiscal policy, on which a Central Bank should work in close harmony with the Government.” (Exter Report, p 15). Accordingly, a degree of independence has been afforded to the Central Bank of Sri Lanka, unlike other Governmental bodies. This independence extends to the budget of the Bank, job security of key Central Bank officials, and power to make monetary policy without consulting the Government. The wisdom of Exter was that the Central Bank should as far as possible work in consultation with the Government, rather than in isolation. He believed that the true independence of the Central Bank could be preserved only through that consultative process. In the words of Exter, “the ideal is….one in which there will be continuous and constructive co-operation between the Monetary Board and the Government. The principal instrument for achieving this co-operation should be the Permanent Secretary to the Ministry of Finance, whose membership on the board will ensure at all times that his Minister’s views will be known to the other members of the board” (Exter Report, p 16). However, Exter did not expect this arrangement to be effective at all times. Hence, he made the proviso that “it would depend on the men occupying the key positions” and not on any legal formula. He argued quite correctly that such complex and delicate relationships cannot be established full-blown by a piece of legislation. It must be the result of years of experience and the slow growth of political conventions.